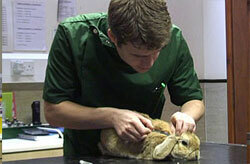 Myxomatosis is a common disease in wild rabbits in the United Kingdom and other parts of the world. This article discusses the use of the myxomatosis vaccination, available in the UK, as a preventative measure against the disease for pet rabbits. Infection can therefore occur without direct contact between rabbits. In the UK, we are lucky to have access to a vaccination against myxomatosis and we recommend to vaccinate every pet rabbit from 6 weeks of age. While being the best protection available, this vaccination is not 100% effective and some vaccinated individuals may still contract the disease. However, vaccinated rabbits which sadly get infected will develop a milder form of the disease and have a greater chance of recovery. Vaccination is contraindicated in pregnant or sick individuals and we recommend that your vet gives your rabbit a good check over before the injection. 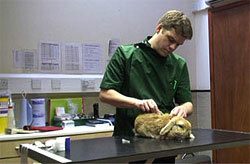 At the present time, there is only one type of vaccine available against myxomatosis. It is called “Nobivac myxo” from Intervet. Most of it is administered under the skin, and the remaining is given intradermally which means into the thickness of the skin itself. or through a separate injection in the scruff. It is also possible to administer both the subcutaneous and the intradermal through a single injection at the base of the neck. 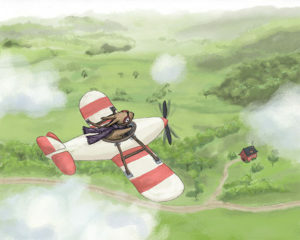 After the first vaccination, regular boosters are required. Where the risk of myxomatosis is high, boosters should be given every 6 months. Myxomatosis tends to be a seasonal disease with outbreaks occurring in late summer. Therefore, the optimal time for vaccination is in the late spring to provide good protection during the summer months. Finally, it is important to note that insect control is also an important way to minimise the risk of infection. Editor’s Note: Myxomatosis is not as common in the US as it is in the UK, and so the myxomatosis vaccine is not readily available in the US. Therefore, in regions of the United States where myxomatosis does occur sporadically, such as the coastal areas of California and Oregon, the best way to prevent the disease is flea and mosquito control. Julien Poublon, DVM MRCVS is part of a team of qualified UK vets at Vetstoria, which propose free web services to help pet owners understand and manage their pet's health. While spending most of his time developing Vetstoria, he enjoys working part time for the Lady Dane Veterinary Centre in Faversham, Kent.